Good morning, sunshine! You are so screwed. The light coming in through the window is so... there. You'd kill for a glass of water and die if it came with food. Your guts are in full rebellion; whatever happens next is going to happen in the bathroom. And for some reason you can't remember how to read the clock next to your bed, even though you used to be able to do it relatively easily, you're sure. You have at least a couple of the following symptoms: headache, malaise, diarrhea, loss of appetite, the shakes, fatique, and nausea. You might also be dehydrated, and feel generally slow - a little stupider, a little less coordinated. You, my friend, have a hangover. Scientists have a more inscrutable name for it: veisalgia, from the Greek word for "pain", algia, and kveis, a Norwegian word meaning "uneasiness following debauchery". That sounds about right. Nobody had more fun than me. There's so much cool stuff from the Apollo missions that I was in awe. I need to go back, preferably by myself, so I can take it all in without feeling rushed. When we hit the gift shop at the end I poked around. I picked up a t-shirt with Albert Einstein's quote “Life is like riding a bicycle. To keep your balance, you must keep moving.”, which I wear regularly on my YouTube channel. 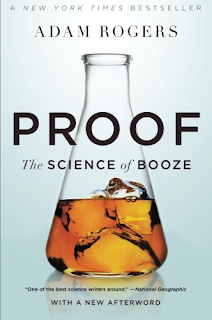 Then I saw this book called PROOF: The Science of Booze. I had to have it. It turns out it was one of the best purchases I've ever made in alcohol education literature. Adam Rogers is a science writer with, obviously, a charming sense of humor. He's an editor for Wired Magazine and his resume is full of science writing experience. He, like myself, appreciates both the history and science of alcoholic beverages, as you can see in this graphic I made quoting Proof. His preferred form of alcoholic beverage is Scotch, so a lot of the book uses distilled spirits as a focus. However, he gets into sake, beer and wine when you'd expect him to. Did you know that it wasn't known that there was a different yeast strain for lager than ale until Carlsberg isolated it? And speaking of yeast, that's where the book starts off. 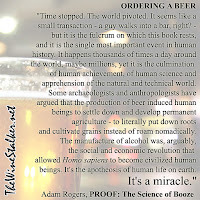 Adams gets into how the little buggers transform sugar into alcohol, how we unknowingly used artificial selection to create yeasts that best served whatever we were making before we knew yeast existed, how we make them today, breed them, and store them. Then he gets into sugar. This of course discusses the different kinds of sugars and its importance to alcohol, but most of it is the story of a Japanese man named Takamine who went to New Orleans to create a faster way to ferment sugar. It also mentions why rabbits eat their own poop and we don't. The fermentation chapter is where Adams' ability to tell a story and teach you how things work (without confusing the hell out of you) really shines. I haven't seen anybody describe the process of fermentation in such an in-depth extent and do it in a way that anybody can understand. From there we go from natural processes to technology. The distillation chapter has Adams travelling to Scotland and California but it also tells the tale of Maria the Jewess in ancient Alexandria. Spirits aren't really my cup of booze even though I'm a Certified Specialist of Spirits, so I was happy to see some history that was unknown to me. Then it's on to aging where we have the mystery of a strange fungus growing on the roofs of houses in Canada. Could it be from the fumes of aging whiskey nearby? Hmmmm? It jumps out of the booze and into what alcohol does to the body with a chapter on smell and taste, a chapter on body and brain, and then... hangover. There was plenty of opportunity for me to get completely lost in these last three chapters because I know nothing about the science of the human body. My wife is a nurse so that's her area. But at no point did I sit there and think "I have no idea what the eff this dude is saying right now." Again, Rogers has an ability to completely nerd out and teach you confusing things, make them not confusing, and have you like it. This is an incredible book. You need to read it.